Real Light Makes "The Painter of Light" Shine! 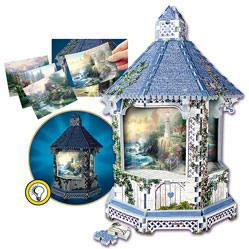 Place four award-winning Thomas Kinkade paintings in the Gazebo. A light in the centre of the Gazebo shines through and makes the paintings glow! Simply fantastic. The puzzle includes a light module and requires two batteries (not included). Size (inches): 11.81" X 3.54" X 10.24"